Doomed 617 Squadron Lancaster ED925 "M for Mother" releases its Upkeep "bouncing bomb" too late as it staggers under the defending flak on the Mohne Dam on 17 May 1943. The Type 464 (Provisioning) aircraft, specially adapted for the precision bombing operation against the German dams, had already been damaged on the way to the target. Its front gunner was probably dead and the pilot, 21-year-old John Vere Hopgood, was wounded. He made the squadron's second attack on the Mohne. The German flak 38 gunners, alerted by Guy Gibson's first run, hammered AJ-M during its low-level approach, setting fire to the port engines and a starboard wing fuel tank. 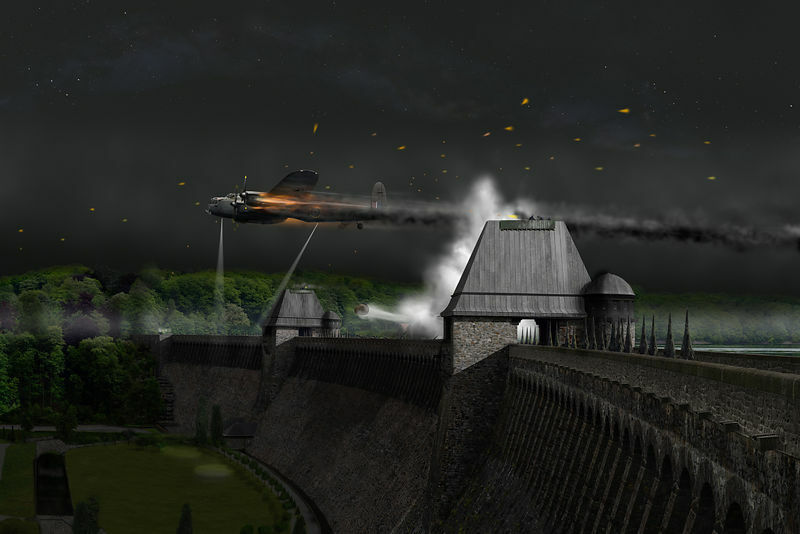 The weapon skipped over the dam and landed by the power station below, demolishing it in a huge fireball. Unable to gain height, the Lancaster crashed some three miles away. Incredibly three of the crew had managed to bail out but only two survived, becoming prisoners of war. The other four went down with the plane. NOTE: My picture reconstructs the dam as it appeared at the time. The towers had different roofing then, which was cut down to accommodate single 20mm Flak 38 anti-aircraft guns on each. The parapet was different, with drainage chutes along its length at roadway height. There was no whitewash on the roadway or towers. There were fake fir trees along the top of the dam (presumably as an attempt at camouflage). There were gardens between dam and power station, all washed away in the attack and replaced now by a bigger compensating basin. My thanks to Clive Rowley for his advice and some of the wartime reference photos.